How are Kumato® tomatoes different from traditional tomatoes? The colour of Kumato® tomatoes varies from dark brown to golden green. This is its natural appearance. Although they may look as if they are unripe and they will be bitter to the taste, this family of tomatoes has an authentic and intense flavour. They are sweeter than normal tomatoes, with a contrasting slightly sour note, which makes for a unique and clearly defined taste sensation. Furthermore, Kumato® tomatoes are very juicy and firm in texture, which means they are an excellent choice when preparing delicious salads and many tomato-based recipes. How can I recognise a Kumato® tomato in the store? Genuine Kumato® and Snack Kumato® tomatoes can be recognised by the special label applied to them following the final quality control. Do not accept imitations! What size are Kumato® tomatoes and how much do they weigh? The Kumato® is fairly standard in size, with a diameter of 5 to 6 cm. It generally weighs between 80 and 120g. 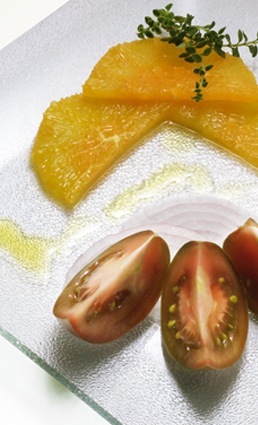 What is the origin of Kumato® tomatoes? In the 1970s, Luis Ortega would often go with his father to the fields cultivated by his family in the village of Agra, on the Almerian coast. His curiosity led him to discover that the tomatoes at the end of the lines, which received less water, were a different colour, but were much more intense and sweet in flavour. Having observed this, the young farmer set himself a personal challenge: to grow a tomato with an authentic and intense flavour that was a different colour. This was how the Kumato® tomato was born, on the shores of the Mediterranean. Why are Kumato® tomatoes sweeter than most tomatoes, in spite of their colour? Quality is dependent on many factors, most importantly the variety and the growing conditions, but never the colour. Kumato® tomatoes come from special tomato plants that naturally produce dark, extraordinarily sweet fruits. This is due to their "brix level" (fructose content), which is naturally higher than that of traditional red tomatoes. Moreover, since all the tomatoes marketed under the Kumato® brand grow and ripen under optimum climatic conditions and they are carefully selected before they are commercialised, consumers can rest assured that all the fruits will have the same intensity of taste and concentration of flavour. Are Kumato® tomatoes genetically modified products? Not at all! Kumato® is the outstanding result of tireless efforts to apply traditional plant breeding techniques and natural cultivation methods. Its origin can be found in the wild tomatoes which grow spontaneously and which adapted to withstand the dry and salty conditions of the Mediterranean region. Many excellent varieties have existed naturally for millions of years, and new varieties can be obtained by means of classic crossing techniques. Many of these varieties have not been cultivated on a large scale to date for several reasons, mainly related with cost and technical difficulties (they are too delicate, they do not have a high yield, they do not adapt easily to different climates, etc.). Kumato® tomatoes reflect the supreme creativity of nature, which we have successfully brought to your table at a reasonable cost and – drawing on our expertise of today’s agronomic techniques and processes – by means of natural cultivation methods! Where can I buy Kumato®? Kumato® is currently distributed in most Western European countries. Please consult the section on this website marked "Where to buy them”. Is Kumato® imported from outside the EU? No. All the production comes from Europe. Kumato® tomatoes are grown in Spain, France, Belgium, Switzerland… Thanks to the different locations and climatic conditions of the various plantations, we are able to offer consumers an all year round supply of fresh and tasty products of consistently high quality. Rigorous protocols and strict selection criteria guarantee exactly the same standards of quality for each crop. How should Kumato® tomatoes be stored to preserve their flavour? All Kumato® tomatoes are vine-ripened and picked when they are ready to eat, so no waiting is required – they can be eaten immediately. Uncut, they can be kept for up to 2 weeks at room temperature. It is advisable not to keep tomatoes in the refrigerator, because the cold will reduce their fructose, leading to a loss of flavour. However, Kumato® tomatoes cut into pieces or slices should be kept in the refrigerator, in a hermetically sealed plastic container. What response has Kumato® had from consumers? Kumato® has received a very positive response all over Europe (you can read some of the consumers’ comments about Kumato® here) and it is gaining an increasingly strong foothold in the market. Why can I not find them in my store? Selecting good growers with the capacity to guarantee the strict quality standards required by Kumato® takes time. Accelerating production would compromise the quality standards of Kumato®. Nevertheless, the extremely positive response from consumers has persuaded our growers to increase the size of the plantations, and perhaps other producers will embark on this adventure with Syngenta in the near future, with the result that Kumato® tomatoes will become available in more supermarkets. Do the Kumato® producers grow any other types of tomatoes or vegetables? Yes. In fact, these producers are true experts on tomatoes, and they grow other high-quality tomato varieties, as well as other types of vegetables. For more information, please visit the section “About us”. What is the nutritional content of Kumato® tomatoes? Kumato® is a very healthy food. Frequent consumption is recommended as part of a healthy diet. It is especially rich in potassium, magnesium and vitamins A and C. Furthermore, it is low in calories (31 kcal per 150 g) and, of course, it has no cholesterol or saturated fats.